An innovative three-way combination of bifenthrin, zeta-cypermethrin and imidacloprid, Triple Crown® T&O insecticide offers multiple modes of action on more than 30 above and below-ground turf and landscape pests. Triple Crown provides fast-acting, long-lasting, broad spectrum control of pests including ants, fire ants, grubs, chinch bugs, annual bluegrass weevils, ticks, mites, billbugs, mole crickets and more! 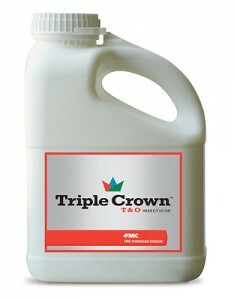 Among the fastest liquid insecticides now available for turf and landscape professionals, Triple Crown is labeled for broadcast lawn treatments, mound treatments and landscape applications. Available in a novel suspoemulsion formulation, Triple Crown T&O insecticide is registered for use on lawn and landscaped areas around residential, institutional, public, commercial and industrial buildings, parks, recreational areas and athletic fields.